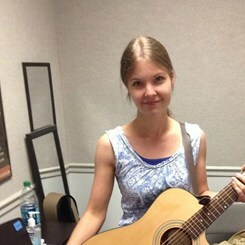 Erikka teaches guitar and piano at Music and Arts. She specializes in teaching young beginners. Her patience and gentle style works well with any beginning to intermediate student, but she has a wonderful way with kids. She has a Associates of Fine Art in Music from Central Piedmont Community College. She is currently working on her Bachelor of Arts in Music at Queens University. She enjoys music of all styles and especially enjoys talking New England Patriots football. She can recite all of Tom Brady's records by heart. Just ask her! Request Lessons with Erikka today!